Resting in the western side of the bustling city of Hyderabad, the magnificent Golkonda Fort is situated approximately 11 km away from the city centre. The name Golconda comes from a Telugu word ‘Golla Konda’ which implies shepherd’s hill. Golconda fort stands tall as a perfect model of a defensive structure consisting of walls and mounds, which strengthen it to a distinguished degree. The Golconda Fort primitively belonged to the Kakatiyas of Warangal (a mighty dynasty that dominated most of the Telugu speaking domains extended by present day state of Andhra Pradesh from 1083 to 1323 CE). The sculptures and stucco works consisting of lotus, gryphons and peacocks at the entranceway of the Bala Hisar pavilion gets along as a substantiation of Kakatiya's connection with the fort. Following the subsequent reigns of Bahmani Sultanate, the Golconda Fort became the home base of the Qutb Shahi kingdom during AD1518. The following history concerning to the fortress is reckoned as most determinative since the fort was expanded and considerably bastioned. Golconda fort is looked at as one of the most prominent fort complexes across the country was stationed on a 400 feet hill, and it sports three courses of monumental walls of 12 m height. The out-most wall was equipped with a tough fosse encompassing a large area around the town with a perimeter of 7 km. Furthermore, it features eight distinguished entrance-ways and is braced with 87 citadels standing to an altitude of 15 to 18 meters. Every single citadel was equipped with cannons of altering quality making the fort unassailable and secure among the other forts of the region. 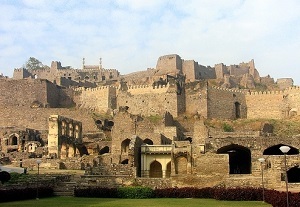 Golconda fort has a dramatic show, and its elevated area is encompassed with the remains of arsenals, cartridges, masjids, garners and artificial lakes. The fort has a smartly developed water system as the water brought up by water wheels was kept aside for future use in tanks at different floors. The collected water was swimmingly passed on to assorted mahals, other flats, roof gardens and founts in the bastion by stone aqueducts (conduit that resembles a bridgework but channels water over a valley) and channels of pipings. Golconda Fort Acoustic System - Engineering Marvel! 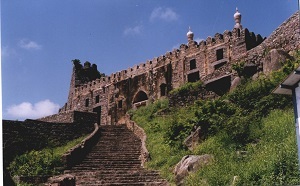 A Singular signaling (acoustic system) device was installed and integrated within the structure of Golconda Fort. The assorted buildings are so located as to function through the medium for transmission of sound to different far-off locations. This is considered as an engineering marvel that a clap sound generated at one point can be well heard at the other far-off point in no time though it may not be audible to a much closer point! It is conceived that this sound signalling design was intentionally planned to carry information to the sentries put up on top of darbar hall concerning the important and influential people who pay a visit to the fort and also as a warning setup in case of emergencies. The ventilation system of the Golconda Fort is extraordinary featuring advanced conception as they were so elaborately contrived that breeze can enter the fort and the place cool even during summer season. What is more, the massive gates of Golconda Fort are beautified with knife-like iron spikes that forestalled elephants from getting into the fort complex. Some of the other structures found inside the Golconda Fort include Ambar khana, Camel stable, Durbar hall, Habshi Kamans, Ashlah Khana, Mortuary bath, Nagina bagh, Private Chambers, Ramasasa's kotha, Taramati mosque and many other sensational structures. Highlights: Bala Hissar (highest point of the fort), Rahban cannon, factories, water system, fascinating acoustic system, Royal apartments and so on. APSRTC buses are available at frequent intervals. Furthermore, one can reach Golconda Fort from Charminar, and it is best to choose the Gandipet direction road. In addition, it is approximately half-hour drive from the airport in normal traffic hours. Apart from the government transportations, autos, share autos, taxi cabs are available from all points within the city of Hyderabad. Today, Golconda Fort still stands majestic enduring rich history and exhibiting a beauty as one of Hyderabad’s most distinguished architectural marvels. This is a very beautiful place to visit in delhi, i visited this place almost one year ago and it was the great experience. If you see this place rom far, you will feel that this fort is haunted. But it is very beautiful fort and went there and took many beautiful picture and shared in my blog.